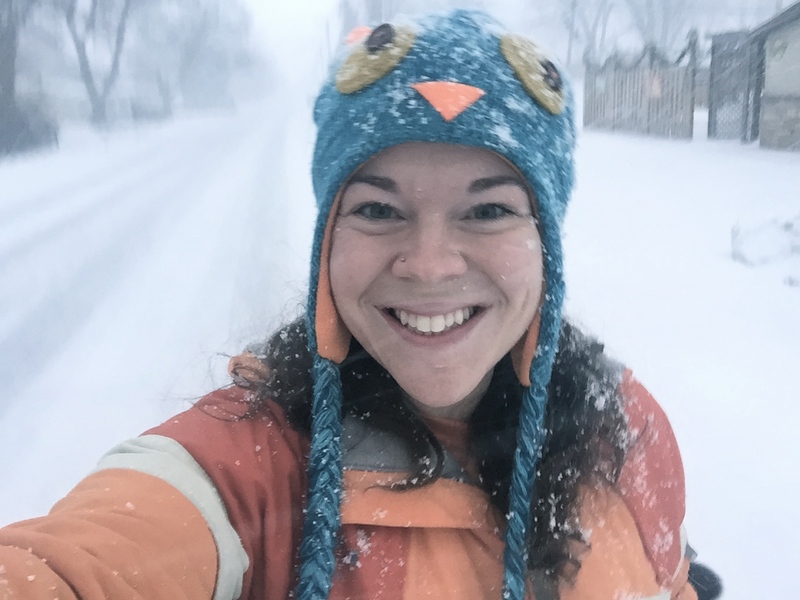 Runs for Cookies: 25 days until Portland! That was at 10:30 this morning on our way home from church! Yesterday, when I woke up, I knew it was going to be a cold weekend, so I took Joey out for a walk before it got SUPER cold. 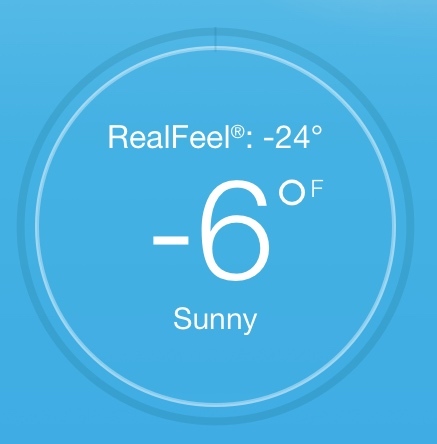 At that time, it was 15 degrees with a "Real Feel" of -7 (the warmest temp of the day, haha). At first, it was really nice outside! There weren't any cars out, and it had been snowing, so the streets looked really pretty. You can't really tell in the pics, but it was snowing SO hard--it was hard to even keep my eyes open. You may notice that Joey has a new chain leash, instead of the red woven one. He was driving me CRAZY when we'd go for a walk, because he started playing tug-of-war with his leash! I couldn't pull it away from him, because that just made him think I was playing along, but I couldn't drop the leash either, so there was nothing I could do to stop him. I tried giving him a toy to carry when we walked, and that worked okay, but I had to keep stopping because he'd drop the toy to smell something. I got so fed up with it, that I went to the store on Friday and bought a chain leash to hopefully remedy the problem. It worked like a charm! He tried to grab it, and realized it wouldn't work too well, so it hasn't been a problem since. We walked to my parents' house and played for a little bit in their yard (yes, it was freezing!) and then took the long way home. It was still snowing hard, so I couldn't really see the lake, but I thought it was so pretty! I almost called Jerry to come pick us up, because my legs were completely numb from the cold. I'd thought jeans would be enough, but I was wrong. We kept moving, though. When I got home, Jerry left to go play Snowball Softball. I thought he was CRAZY to go when it was so cold outside. Meanwhile, I got warm under the electric blanket on the couch. Normally, Estelle is right there to sleep on my legs (she loves the electric blanket!) but she's been ignoring me ever since we got Joey. 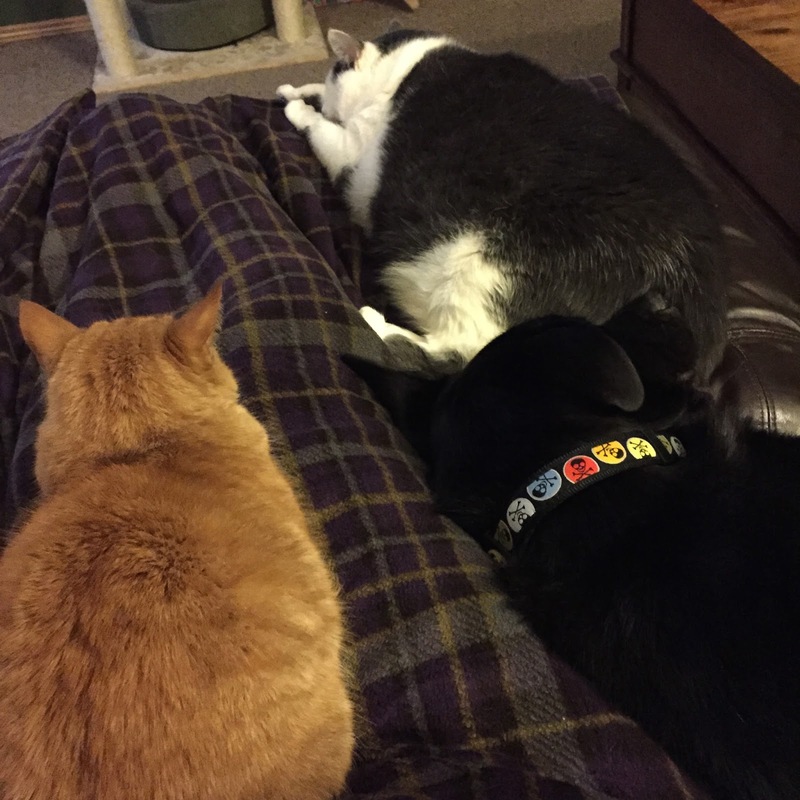 I was pretty surprised, though, when I wound up with not one, but THREE pets laying with me. Chandler and Phoebe still don't like Joey, but they are tolerating him. I really hope that Estelle comes around soon--I miss her! She's been hiding out on the top bunk of the kids' bunk beds every day, and she only comes down to eat and use the litter box. There are only 25 more days until I go to Portland!! I'm SO excited I can't even stand it. I really hoped I'd be back at my goal weight before the trip, but that's not going to happen. I'm only down two pounds since AUGUST. I haven't been at all consistent, so I know that to make real progress, I need to buckle down and stop making exceptions for whatever reason. After Andrea was here last month, and she told me the idea of "Just get it over with", I've done much better with tracking my food. I do try to keep in mind that I need to just do it so that it's DONE. I don't have anything going on between now and when I go to Portland, so I'm going to try extra hard to drop a few more pounds before I go. If I track consistently, I could probably lose 5-7 pounds before I go, and I'd be very happy with that. The kids are off school all this week for winter break, so I'm going to have lots of stuff planned to keep busy. Joey gets neutered tomorrow; on Tuesday, I have a painting class at a coffee shop (Jessica asked me to go, and it sounds fun! ); Wednesday, we're going to my younger brother's house to let the dogs play; Thursday and Friday, we'll probably do a hands-on museum and library. I'll also take the kids to the rec center every day to get some activity while it's so cold outside. I've found that the best way to stay on track with my eating is to stay as busy as possible! Don't forget, tomorrow is Motivational Monday! If you have a photo you'd like to submit, you can see the instructions for doing so here. Remember, it can be anything health or fitness related that you're proud of--it doesn't have to be a completing a race or losing a ton of weight! Katie would you be up for meeting Portland peeps at somewhere like Salt & Straw or Saint Cupcake? Not sure how long you are going to be here, but I think you'd really dig Salt & Straw! Mom's cat has been in hiding since she got a lab --3 1/2 years ago. He just wants to play with her, but he lunges and jumps and she just won't trust him. She hisses and swats at him when he finds her hiding under a table with a long cloth over it. The register is under that table, so she is very protective of that spot. I've been wearing long johns forever here in NY (not city, but Central NY). Soooo cold this winter. Keep tracking and you'll lose a few and have another reason to smile in Portland. Yes! My dog got a sore in between her toes from walking on asphalt and gravel so much when I wasn't able to run last year and then got one a couple of weeks ago from running on the frozen snow in the backyard. I bought some hydrocortisone and that helped a lot. I was going to say the same thing, we just had a female spayed and there's no rough housing for 2 weeks. Please go with what the vet recommends, don't want any busted stitches. It has been brutally cold hasn't it. I love Joey's collar! Love the tree picture!but that picture of your animals in your lap just made me laugh out loud!